Fortune 500 companies utilize airport advertisements on airport signage to make an impact and distinguish themselves from other advertisers. 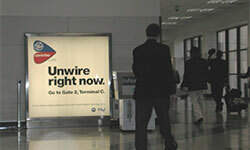 With air travel becoming more common, airport advertising signs -- at low airport advertising costs -- are here to stay. 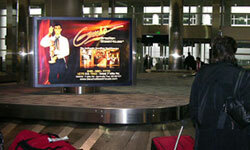 Airport advertising displays (which some refer to as airport billboards) reach all kinds of people before and after their flights, including business persons, vacationers and students. The airport signs are visible to all travelers -- while they walk to the gate for a flight departure, or as they return to baggage claim from a trip. Airport advertisements generally come in a few sizes, including airport diorama, mini spectacular, spectacular and airport banner. Other sizes are also available. All are effective in reaching the masses that fly -- the only difference is the display size and price. 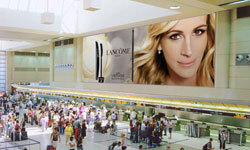 Advertising in airports with airport dioramas is the most common form of advertising found in airports, while airport banners are highly effective in garnering large gross impression figures. 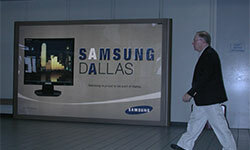 Advertising in airports before or after a flight using airport advertisements on airport media is effective for all types of companies and organizations, including government and nonprofit organizations who regularly use airport ads. 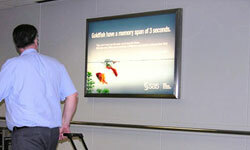 Minimum of 5 to 20 airport advertisements, depending on the airport medium, timing and market. All rates and mimimum purchase figures for an airport ad depend on the airport ads medium, timing and market, and airport ad availability may change without notice. 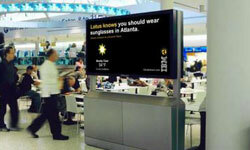 Airport advertising is available nationally in medium and large markets. See below for the average number of times an airport ad is seen (i.e., airport advertising impressions or views) and the average airport ad size/dimensions and specifications. Range of impressions/views depends on market.